On Thursday, January 5th, 2012 from 6pm until 9pm, TEDxMaui co-producers Katie McMillan and Sara Tekula will host a free evening film screening and “talk story” to prepare the Maui community for their upcoming TED-inspired event. The limited-space gathering will be held in the Media Lab space at Akaku: Maui Community Television, located at 333 Dairy Road in Kahului. TEDxMaui 2012 ticket holders and curious community members will have the opportunity to watch “The Future We Will Create: Inside the World of TED”, an 83-minute documentary filmed on-location at the annual TED conference. The film, which was directed by actress Daphne Zuniga and released in 2007, features appearances by Al Gore, Peter Gabriel, Anthony Robbins, Julia Sweeney, and the founders and innovators of many important technologies and new ideas. 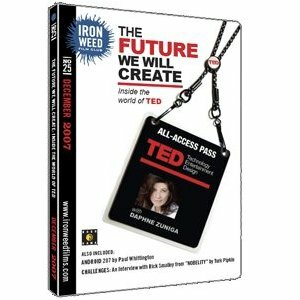 The film provides an all-access pass inside the world of TED, to what Wired Magazine refers to as “arguably the hottest gathering around”. After the film screens, attendees are invited to ask questions and “talk story” with McMillan and Tekula about the event which is scheduled for Sunday, January 22, 2012 at the Maui Arts & Cultural Center’s Castle Theater. Matthew Murasko, OluKai Premium Footwear’s Hawaii Marketing and Brand Specialist, will also be present to talk about OluKai’s support of TEDxMaui and share some of their own footage from their “Talk Story” series which features some of Hawaii’s most inspiring people. Individuals interested in attending the screening and talk story should confirm their interest, by emailing info@tedxmaui.com or by signing up via the Facebook invite. Tickets to TEDxMaui are still available, and seating is limited. Click here to learn more.